Disclaimer: all information collected will be aggregated and used anonymously. No additional data other than your answers will be collected. LEGO will not sell or distribute collected information beyond the immediate purpose for which it was solicited. 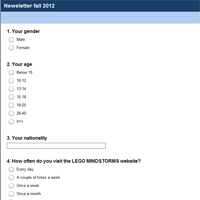 You will not receive any emails or other direct communication as a result of taking this survey. In order to effectively use the data collected, please answer the survey only once, but feel free to let your friends know about the survey. will you post the competition soon? Okay good I have been wondering where you have been.